An efficient workhorse for a busy office setting, Xerox WorkCentre 3550 is an all in one machine with print, scan, copy, and fax functions. It allows multitasking and has the ability to receive fax while printing or copying. 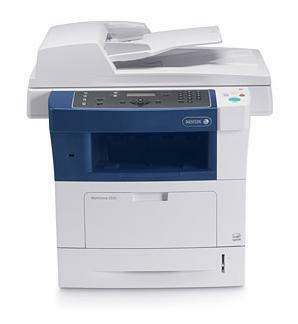 The XeroxWork Centre 3550 has a print speed of up to 35 pages per minute, and allows faxing from the desktop via PC fax. Save precious office space with this all in one device. The Xerox WorkCentre 3550 is compact enough for desktop use, but can be configured as a standalone floor unit. It features a 14" platen glass for easy document scanning and copying, and a built in DADF (duplex automatic document feeder). The Xerox WorkCentre 3550 has a reliable 550 sheet paper capacity (expandable up to 1,050 sheets) and allows two sided output for printing, scanning and copying. Hardcopy documents are easy to convert to digital files (PDF) and then sent to the server, USB device, or email contacts. The Xerox WorkCentre 3550 is a dependable cost saving tool, thanks to its toner and power save modes. Secure your faxed or printed documents using a security PIN. The Xerox WorkCentre 3550 can be hard to set up without the help of networking professionals. Firmware may need to upgrade the machine and maximize functionality.